Ready for action - Rowena Bolt (Belfast, NI) weighd in at 54kg withSwiss fighter Naomi Kongolo at 55kg for this afternoon match at the Holiday Inn. Rowena Bolt (Belfast, NI) weighed in at 54kg with Swiss fighter Naomi Kongolo at 55kg for this afternoon match at the Holiday Inn. 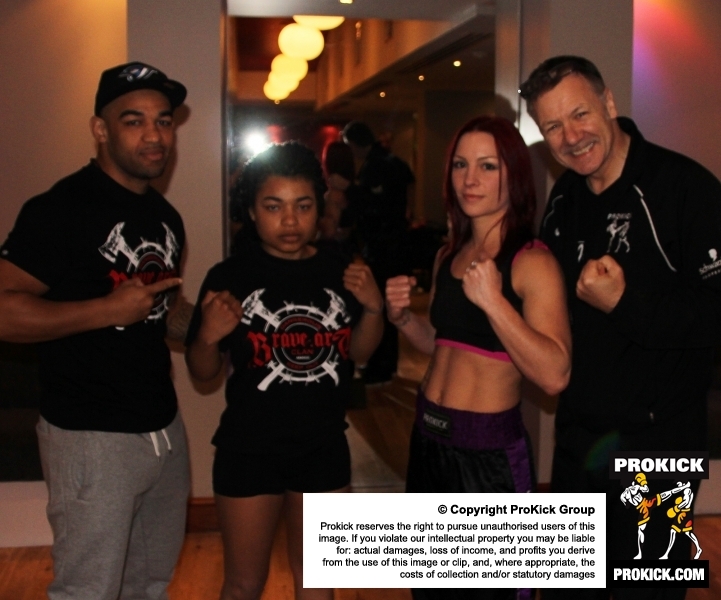 Kickboxing elite hits Belfast for TODAY’s WKN ProKick event, billed as ‘The New Breed’. 30 New fighters will take to the ring at the Holiday Inn Belfast. Fighters from Switzerland, Belgium, Poland, Romania, England, Scotland, and the home nations will all meet under the banner of the Peace Fighters. Whoahhh !! Quel spectacle ! Bravo aux organisateurs et aux arbitres. Wilhem de la Team Kongolo qui viennent de Suisse avec leur entraîneur Yoann Kongolo ! A great days kickboxing at the Holiday Inn, Congratulations to all the fighters for putting on such a great show and a big thanks to all the officials, visiting coaches and medical staff without whom it wouldn’t have been possible. I thoroughly enjoyed the event and it was good to see such a variety of visiting teams , our Pro Kick kids got us off to a great start and Johnny Smith closed the show with a terrific performance against a very talented opponent. Many Congratulations to Mr Murray for putting on a great fight card and for all his hard work coaching Team Pro Kick, they were a credit to him today. Regards.